For the first time an investigation into Voith Schneider Propulsor-induced hull-pressure fluctuations has been carried out. 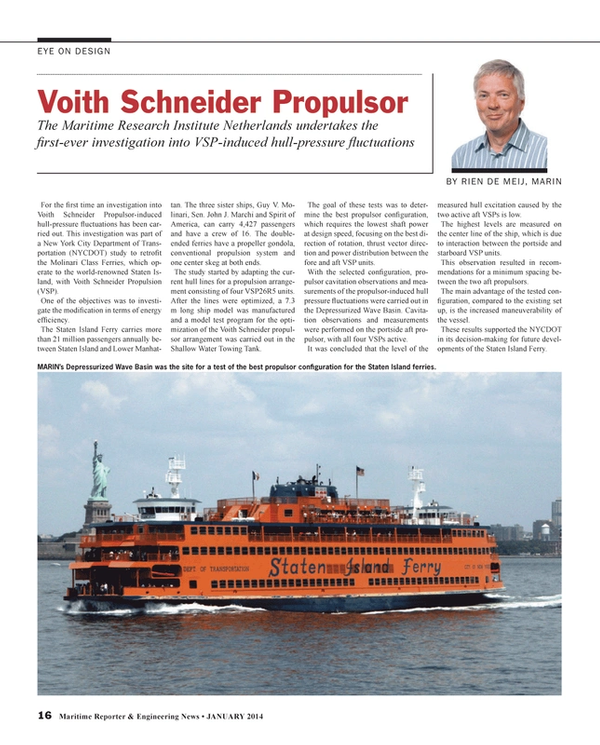 This investigation was part of a New York City Department of Transportation (NYCDOT) study to retrofit the Molinari Class Ferries, which operate to the world-renowned Staten Island, with Voith Schneider Propulsion (VSP). One of the objectives was to investigate the modification in terms of energy efficiency. The Staten Island Ferry carries more than 21 million passengers annually between Staten Island and Lower Manhattan. The three sister ships, Guy V. Molinari, Sen. John J. Marchi and Spirit of America, can carry 4,427 passengers and have a crew of 16. The double-ended ferries have a propeller gondola, conventional propulsion system and one center skeg at both ends. The study started by adapting the current hull lines for a propulsion arrangement consisting of four VSP26R5 units. After the lines were optimized, a 7.3 m long ship model was manufactured and a model test program for the optimization of the Voith Schneider propulsor arrangement was carried out in the Shallow Water Towing Tank. The goal of these tests was to determine the best propulsor configuration, which requires the lowest shaft power at design speed, focusing on the best direction of rotation, thrust vector direction and power distribution between the fore and aft VSP units. With the selected configuration, propulsor cavitation observations and measurements of the propulsor-induced hull pressure fluctuations were carried out in the Depressurized Wave Basin. Cavitation observations and measurements were performed on the portside aft propulsor, with all four VSPs active. It was concluded that the level of the measured hull excitation caused by the two active aft VSPs is low. The highest levels are measured on the center line of the ship, which is due to interaction between the portside and starboard VSP units. This observation resulted in recommendations for a minimum spacing between the two aft propulsors. The main advantage of the tested configuration, compared to the existing set up, is the increased maneuverability of the vessel. These results supported the NYCDOT in its decision-making for future developments of the Staten Island Ferry.